A collaborative effort of cemetery preservation advocates working to increase public awareness and activism in preserving, protecting and restoring endangered and forgotten historic cemeteries worldwide. (a) The care accorded the remains of deceased persons reflects respect and regard for human dignity as well as cultural, spiritual, and religious values. The General Assembly declares that human remains and burial objects are not property to be owned by the person or entity which owns the land or water where the human remains and burial objects are interred or discovered, but human remains and burial objects are a part of the finite, irreplaceable, and nonrenewable cultural heritage of the people of Georgia which should be protected. No known cemetery, burial ground, human remains, or burial object shall be knowingly disturbed by the owner or occupier of the land on which the cemetery or burial ground is located for the purposes of developing or changing the use of any part of such land unless a permit is first obtained from the governing authority of the municipal corporation or county wherein the cemetery or burial ground is located, which shall have authority to permit such activity except as provided in Code Section 36-72-14. Currently [November 2004] there are no preservation or conservation groups formed in Glynn County. Many people here do not care enough about "abandoned" cemeteries to do anything to save them. Only our large, currently active cemeteries have any caretakers, the rest are left to individuals, land owners, or the occasional volunteer [which are few]. 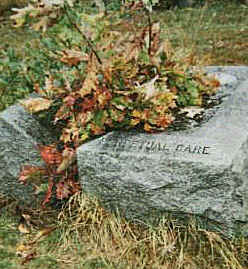 I personally have only been contacted by one person who is willing to help clean and preserve cemeteries. Most abandoned cemeteries are on paper company lands that are being sold for residential and commercial use. These cemeteries may face destruction by new land owners, which is a felony, yet no one seems to care, especially if they have no markers, like slave cemeteries. Another downfall of this county, is that no one communicates with others, to let folks know that someone is taking care of or maintaining a cemetery. And then there isn't anyone, that I know of, who is skilled in the trade of preserving and conserving a cemetery properly. I have seen many tombstones being bleached, or having other chemicals applied to clean them, by caretakers, one such place is Oak Grove Cemetery, one of our oldest cemeteries. In this fast paced world, time is money, and cemetery preservation only costs money. I have made it my goal, to locate, and survey every cemetery I can find, in hopes that they do not get destroyed. The more the public knows about a cemetery, the less likely it will disappear. The cemeteries linked from here are housed on the GlynnGen.com website. The majority were transcribed by Amy Hedrick. A few were transcribed by other folks and sent to the GlynnGen site for publication. All of these cemetery pages have been copy protected due to recent "theft", this is by no means meant to deter researchers from using the information in their own genealogical or historical research. The majority of these transcriptions have photos for each tombstone found in said cemetery. Just click on the person's name if it is in blue. The photos chosen for the website are not the only photos. Close up photos of each tombstone are available upon request, without copyright information across them. However, these photos are under copyright by law, and acceptable use policies should be followed when using them. My name is Amy Hedrick, and I am the host for the Glynn and Brantley County, Georgia Saving Graves Project. If you have any information you would like to share, or have questions regarding Glynn & Brantley Cemeteries, feel free to email me.